I found this while looking through the Public Records Office images. I don’t think we have anything about this company. A quick check finds that it was started in 1950 and is now (as HAECO) one of the world’s largest maintenance, repair and overhaul (MRO) service providers in terms of capacity. It is owned by Swire Pacific Ltd. I hope you can read the article. 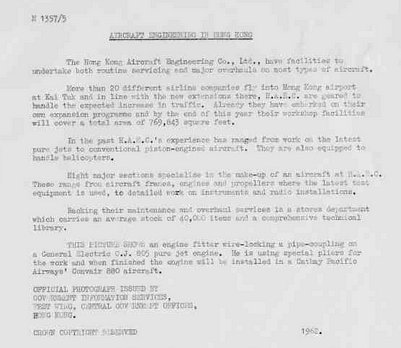 In 1962 the article says 20 airlines flew into Kai Tak. Now around 100 use Chek Lap Kok. 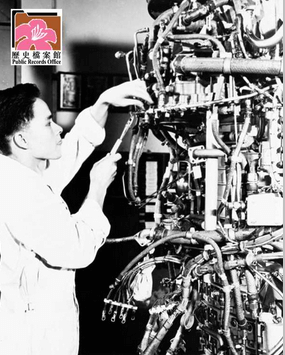 The title for this photograph mentioned in the article is “An Engine Fitter wire-locking a pipe-coupling on a General Electric C.J.805 Pure Jet Engine.